Comparing New Zealand to The United States. Posted byLance Wiggs	 January 20, 2011 January 20, 2011 34 Comments on Comparing New Zealand to The United States. A nice little site neatly sums up many of the reasons why I left the USA to come back home. Sure you can make more money, but pretty much everything else is worse. Add into that the knee-jerk responses since 9-11 that make getting stuff done and moving around oh-so-painful, the general atmosphere of partisan politics and the food. Meanwhile in New Zealand we get to take our annual leave, go to the beach, get outside into the bush and live in a stunningly beautiful place. I do miss the USA though. For all the progress we are making in NZ, and for all that our economy is still on its feet after some pretty good hits, the USA is still the best place to do business. The opportunities are more abundant and the ability to expand is limitless. It is a negative. The correct measure of health benefits is the outcome of longer life. Health costs get subtracted from your income. The US is infamous for spending much more on health per capita for lower outcomes overall. 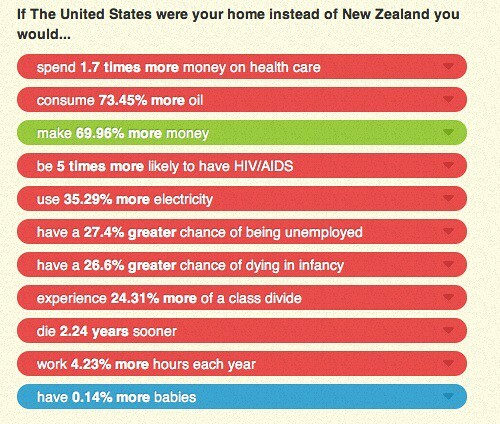 As you will know, since you lived here, comparing the USA to NZ is rather pointless. We are a series of States and California, for instance, has more in common with NZ than it does with Tennessee or Maine. If the survey compared individual states to NZ then there is some value, but comparing a 300 Million strong four-timezone (six timezones if you add HI and AK) monster to NZ is entertainment, nothing more. As a kiwi living on the LA Coast (Venice Beach) it makes me smile. I absolutely agree. The USA is a big and diverse place, and there are locations like Venice which are cool to live in. I also didn’t mention the cool people that I miss from the USA, but then again I didn’t mention the food, or the guns, and be glad for that. Choosing somewhere to live is always about trade offs – Venice versus Santa Monica, DC versus NYC. P.S. Now hop in your car and drive to LAX during rush hour and get on a flight. It takes me about 20 minutes to do so (door to plane door) in Wellington, and 45 minutes in Auckland. (I have a motorbike which makes it easier). Ahhh, I can get to LAX in 10 mins normally, 25 in rush hour (Venice is close to LAX). Now, ask me to drive to Hollywood and that can take 90 mins to two hours. Guns are a big problem. Food, however is not. There are spectacular eateries here. And the prices are way way way cheaper than in NZ. To make the comparison list more accurate there should be home prices and taxes/fees/levies (stated and hidden) added. Hi, are you currently living in NZ? I am moving from Florida to there in a few months and in need of some information. I would say 60-70% of the group friends that I grew up with (went through high school etc) are now working overseas in one of the three countries below…. I have a question and hope you guys can help me. I am a US citizen ( Originally from India) and planning on moving to NZ as I feel that is the place of my dream. Although I have no complain or problem here in the US it just I am done with US I believe ( been here only for 7 years though and live in Fairfax VA). I would like to know if I move to NZ will I need to buy a car right away or NZ has good transportation ? This is one of the things US needs to work on.. they make you to buy a car here as everything is far away and it is hard to walk and get your stuff .. and like that. How about the health care system in NZ ? I had been without health insurance for more than a year and that time God was my doctor ( if US does not change its health care system .. there will be a time when people will be paying for health care only and will not be able to eat or buy anything .. crazy health care system. Anyway if could you please answer these two question I will appreciate it. I am not talking about money because I am a low maintenance guy so even if I get little bit less salary ( I am in IT) in NZ it does not bother me much as long as I am getting a laid back atmosphere , nice society and a beautiful weather. Car – you can get away without one here, but Auckland is tough. Live downtown in Wellington and you will forget you ever had one. Or get a motorbike, and certainly get a bicycle. Health – think Canada. Some sort of thing. The US stands pretty much alone with its insane system. I have not paid any health insurance since leaving the USA. Meanwhile Fairfax VA is awful – I feel for you. Perhaps a move to DC first – you don’t need a car there and it’s far more international. Vineet; I am in in the same boat as you. Any luck with the move? I am in IT-Management (ICT – BA to be precise per NZ standards) with 8+ yrs US experience. I am done with US. Thinking on the move to NZ. Any thoughts suggestions? 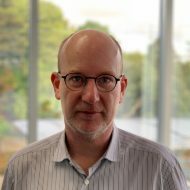 I am born and raised in NZ and although there are ppl who complain about our health system I personally think for a small country we do well, citizens and residents are offered free health care through hospitals, go through a priority cue for treatment/surgery etc but basically any general care needed through hospital is free,there is obviously limitations to treatment/medications and some of these are subsidised by the government and some are not, all depends on the situation. But I am 31yrs old, with a partner and 2 small children, I am currently being treated by local hospital for 2 medical issues and I dont pay a cent. For GP consultations our children get free treatment and medications until the age of 6, then they are charged subsidised fees from the age of 6-18 (my clinic charges $11.50 for child but normal charge is around $20ish for this age), adult consultation at my clinic is $17.50 (normal charge for adult consultation is generally $40-$65) , from memory international residents were around double the charge but if you have medical insurance then this could cover costs while you stay in NZ. Overall our costs are low, and we are well taken care of. Transportation we can not complain about, our largest/busiest city is Auckland and I lived there for several years, yes there were days when there were issues but we have special bus lanes to help public transport keep good time frames, major cities have trains/subway aswell, but overall again this is not a problem- I have lived in cities all my life and I dont really need a car but I choose to have one for convenience, I have recently bought a push bike just because it is summer here at the moment, and I can bike to work from one city boundary to my job in the city within 20minutes by utilising our newly installed underground cycle alleys. Cities have buses that run in every block of the city boundary and at most you may have to walk 15mins to get to bus stop, also have taxies readily available aswell. NZ when in comparison to other places is a safe country, majority of people are friendly and easy going, the beauty of NZ is that it is such a wide diversity in such a small area so moving from one place to another is a small effort, and yet can provide you with a fresh start (if you need to switch jobs etc) . NZ is a multi cultural country and the diversity is supported even through childhood education, my children are lucky to be gifted this country as their home.I have been considering a move to the U.S basically just so I could spread my wings and get a different experience, but the more I type about NZ the more I realise I have alot to appreciate. Well done! You’ve found some absolutely useless stats. 1. The USA may spend US$6,719 on health compared to our US$2,448 but they get on average US$24,500 more each in GDP each. See the green point! 2. Yes they do consume 73.45% more oil than New Zealand but the USA is 384% larger so its a bit further to drive. They also produce one third of their own oil, and we produce…? They also pay about 80 NZ cent a liter. 3. GDP? how do I convert that into pay in the hand? 4. Oh so bad at maths!!! Actually difference from 0.1% (NZ) to 0.6% (US) is 0.5%. So you are 1/2 a percent more likely to have AIDS/HIV not 6 times more likely. 5. Good on them! Of course they owe just a wee bit more than New Zealand. 7. Actually a difference of 8.8% in class divid. More poor Maths and Stats again. Thats some bad maths Harry! 8.”The number of deaths of infants under one year old in a given year per 1,000 live births in The United States is 6.14 while in New Zealand it is 4.85″. In reality thats 0.129 % higher in the USA. 9.Early deaths are probably caused by the 26.6% more dying at infancy or maybe its because of the large 24.31% class divide or all those extra people with AIDS/HIV. Makes getting to 78.2 years old in the USA a bit of a miracle! 10. Yes, working it out they work 15 minutes more a day to make a 35 hour week! Darn I’m still working 40! 11. And in the USA 8% of the 4 million babies (born each year are to illegal immigrants. 4 Million Babies a year! – almost the population of NZ. These people with the website don’t work for the media do they? All those statistics were per capita, so you have no point. Will obtain my certification as a clinical hypnotherapist at year’s end and am considering a move to NZ? I’ve been to the government website, and, of course, they like business people to come into the country, but how well received are expats, really? All I can say people is I am done with the USA, 15years is a good enough taste, I am returning home. Got side tracked on my OE trip. I have a great job E Engineer, Live within 1.5hrs of Tahoe for Snow sports, 2hrs to SF. but the mentality here is it’s all about me, me, me definitely no we! Everyone I work with is cashing in vacation time!!! what!! unheard of in NZ!! Work to Live not Live to work!!!! you will drive yourself insane converting the cost of living. it’s about quality of life! I spent 4 years in UK, 2 years on Aussie and 15years in the US. Living in NZ isn’t about how much it costs!! Tautane, you clearly have not lived in NZ for a very long time. With prices soaring and pays remaining stagnant, a lot of people, including professionals, are cashing in their holidays and are most definitely living to work. Price of petrol is now $2.20 per litre, milk and cheese is right up there too. Living in NZ is all about how much it costs, statistics tell the full story. New Zealanders are leaving in record numbers for a reason. I moved to New Zealand from USA Ohio. I would say it was a mistake. Even the weather in New Zealand is unpredictable. The cost of living is very high. Gas prices are very high. people are rude in general. less civilized. driving her is nightmare speed limit is 80-100 km/hr about 60mph. How long have you lived in NZ, what’s your age, employment? We’re thinking of moving with our adult kids to start an adventure. We plan to first visit – oh also, what island are you located? You’re obvious unhappy – will you be moving back? Last question – how you are treated, is it likely because of where you have located, your accent, color – or, is it how you perceive NZ as a whole? Thanks for your time! I’ve been in NZ for a year, and my quality of life has SUCKED. My income in the US allowed me to live very comfortably, with numerous choices, high quality everything. Here, I’m POOR, living in squalor with fewer choices. I’m sorry, but to me, there is no comparison.. I guess it depends on what you want out of your life. I want to be comfortable and have access to things that don’t cost me 5 times more. I came across this site looking for how New Zealanders can work and move to the US. I am tempted to leave behind my experiences. I have lived and worked there for some 20 years. Originally from India. Now one can not compare countries like buying a product. NZ is a great country, lifestyle choice. Jobs aren’t easy to get and the corporate world is as hectic as any where else in the world. The health system is OK. You pay for GP visits or none depending where you live, meds are heavily subsidised. Schools are great for kids, University is on a student loan. Cars are all Japanese used car imports, not too expensive. Lousy for business and not a place to aspire to become someone big. Make your bucks and then come to NZ. Great place to live that laid back life if you like golf, fishing, cricket and like to keep your own culture. Kiwis are great guys but keep to themselves. They don’t have a dominant culture, so you can be who you are with your own accent, traditions and thoughts. So you tend to live within your own expat community. Met many Americans mostly who came to work there from Hawaii. NZ does struggle at least politically, with multiculturalism, with an indigenous population highlighting bi-culturalism. Doesn’t really bother anyone. Interest rates are high. Mortgages can not be fixed for 30 years like in the US. I feel if you are ambitious which you should be, then your chances are better in a bigger country like the US. Go to a smaller place when you have made something in life. I live now in Sydney, but want to know the best way to get to the US. This helped tremendously on my thoughts of moving to NZ! Thanks! I am a 58 year old welder/fabricator for NOV in the USA. Does your country have a place for me. One daughter,a Texas A&M grad is about to enter med school, one daughter is a culinary grad and my son is close to entering Petroleum Engineering. Can we find a life there. Being able to work to live: priceless. There are some things money can’t buy, as the old MasterCard advert goes. I am considering moving to NZ for a simple life with some Adventure and freedom to wander the Land hunt for myself, I happen to like carrying swords and exploring more than I care about housing. Is this something that can be done here? Any information would be great. As a New Zealander living in the US now here are some advantages I have noticed. 1) Overall the cost of living is much better. Houses are still affordable, about half the price. Interest rates are lower. Taxes (income/sales) are much lower. Gasoline is half the price. A trip to the supermarket doesn’t break the bank. Electricity is also a realistic price for what ever reason. New cars are much cheaper, especially the base models. 2) All this more than off-sets the fact you have to pay your own health insurance costs. Since there is not public health system being run on a shoe string budget the hospitals are nicer, the staff seem much better trained, happier in their jobs, and less stressed out. 3) No ACC, registering a car for two years costs me $120. Car insurance is mandatory. In my mind its something you need anyways, so what I dont pay in ACC levies goes towards that. 4) Most employers worth working for make contributions towards the health insurance costs. They also have much better retirement options. My employer puts 12% in above what I take home, and I put in 8% for a total of 20% into a retirement fund, this makes Kiwisaver look like a joke. On top of this, I get paid a more realistic amount for what I do for an IT career – I make slightly more living in a small out of the way place than I did on contracts in Auckland. 5) It’s possible for my wife to stay at home and look after our first child, with my one income providing everything we need, with some to spare. Even then with WIC (a loose equivalent to Plunket) we qualify for food cheques for our daughter which covers most of her food costs. 6) The state we live in covers the health insurance for children upto the age of 18, including the mother while pregnant (includes dental – wife got all her dental work up-to-date while pregnant at no cost) and the birthing costs at hospital. Again we qualify for it being on one income. 7) The police are not waiting to snap you for speeding by 5km/h around the corner where the speed zone changes to something lower, here at least they tend to leave traffic alone, anything upto 10mph over the limit is largely ignored, not to say I don’t see them with people pulled over from time to time, I figure they must of done something silly enough to get noticed. What state do you live? Are there any states that have laid back atmosphere with longer vacations and shorter commute. Were are thinking about Portland, OR. We have moved to NZ six years ago and like everything here except cost of life. Can’t imagine how can we retire in NZ. So we are thinking moving back. Hey there KiwiUs, I currently live In Maine near Canada on the coast, but I have traveled to Portland OR many times. It is fantastic! Arts, culture, all sorts of cool people and open air markets on the weekends. There is tons of outdoor stuff like Multanomah falls, and a series of other waterfalls you can hike. The beach where the film “Goonies” was filmed is close by and also the end of the Lewis and Clark trail :) The only thing bad that I saw was, they do have a serious homeless problem. It is not uncommon to see 20+ people sleeping under a bridge, lots of drug abuse and prostitution at a very young age. But that is only in certain parts of the city. Personally I have been thinking of moving to NZ for a few years now. I would either be working as a primary school teacher of music and art or working for the forestry dept. I have a fascination with the Maori tribe, their culture and artwork.